Our reinforced steel doors provide an additional layer of security at a variety of facilities in Melbourne requiring upgraded protection. While having security doors may help in some regards, there may be instances in which you or your customers prefer additional security and protection. Whether you are working on a specific building project or you are a retail-distribution partner looking for solutions for your customers, at Spartan Doors, we offer viable options when it comes to the protection, security, and durability of security doors and their features in Melbourne, Victoria. One such option that we are equipped to provide is our reinforced steel doors, which provide an additional layer of security at a variety of facilities requiring upgraded protection. Reinforcing your current door could involve something like burglar-proofing with additional locks and deadbolts, or we offer industrial-strength hardware in our hinges and bolts, as well as a security arm that latches at the back of the door to prevent it from opening. Regardless of your application, our reinforced steel doors offer security, flexibility, and longevity for a variety of applications. Additionally, one of our high-end reinforced steel doors that is ideal for high-security applications is the Bulwark 6000. Using an internal frame and solid core, this door is perfect for warehouses, prisons, power plants and other industrial facilities. If you have questions about our reinforced steel doors or industrial-grade hardware options, or if would like to place an order, contact us at Spartan Doors today for more information. We offer top-quality manufacturing and quick turnaround times, so you can quickly and efficiently install your reinforced steel doors as necessary. When you work with us at Spartan Doors, you will see great results. 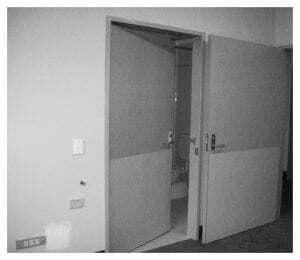 Here at Spartan Doors, we provide the highest quality reinforced steel doors to meet your commercial and industrial needs in Melbourne, Newcastle, Sydney, and Brisbane, Australia.